Mardi Gras 2010….3 Weeks Long??? Mardi Gras Just Got a A Little Longer!!! I have had the distinct pleasure of going to Mardi Gras on 4 separate occasions , each year more insane than the next. With a best friend at TULANE University, the annual trip during my college years was an incredible highlight that I think of often. 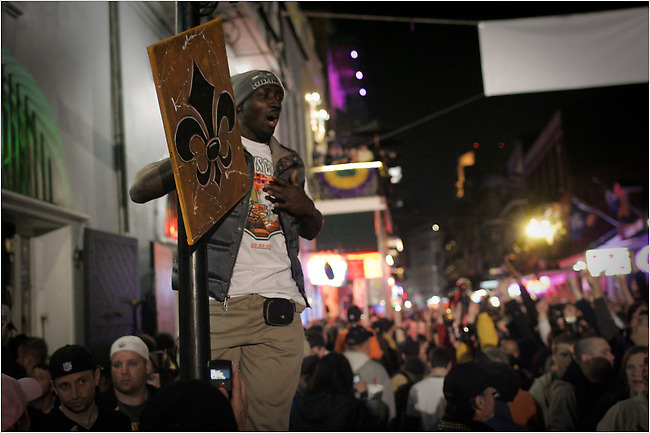 But in the year 2010, just hours after the Saints won the first Superbowl in the history of the Franchise….MARDI GRAS has come early. And with the official start of the greatest party on the planet still 7 days away , its safe to say Bourbon Street will be mayhem for the next few weeks and in the N.O. trust me when I say the party goes all day and all night. As I said last night, this city deserves it! Tonight was a great night not only for Football fans everywhere but also a great night for America and of course most importantly the city of New Orleans. Hurricane Katrina was a real American tragedy that will be discussed and debated for years to come. Americans looks at the tragedy in Haiti and as terrible as it is , it still feels distant. Katrina happened right here in our backyard, an event most proud Americans could never have dreamt would happen within the borders of our great Nation. BUT…It did happen and the city has been rebuilding ever since. The Superbowl is arguably the biggest single day sporting event in the world and with the media spotlight back on the N.O. this team rose to the occasion , and put the city on its back and the Saints faithful rode Drew Brees, Jeremy Schockey and Reggie Bush all the way to the Super Bowl Championship and gave the wonderful city of New Orleans something to brag about and cherish forever..They Certainly DESERVE IT!! This is why I LOVE AMERICA!! The Ad unit at BOOST MOBILE is resurrecting the infamous Super Bowl shuffle crew from the 1986 Superbowl Champs The Chicago Bears. The video of the original is just too funny. RIP WALTER PAYTON!